There are two things I eat out of a mug. Chile and soup. This way it all stays piping hot while you eat it. I don’t make chile often but it is one dish my husband loves and will request. When I put corn into it he thinks he’s in seventh heaven. 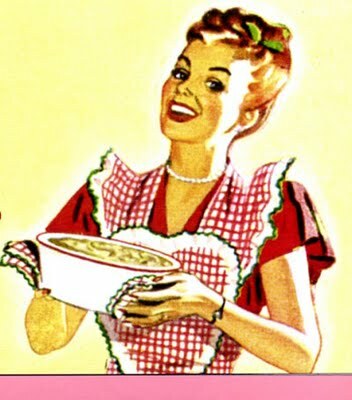 Well, he thinks that when I put corn into anything. If I can’t get him to eat something, chances are that if I throw in some corn he’ll eat it and ask for more. This recipe I have made for years, adapting it when the mood strikes me but the basic recipe is the one I generally make. This is what you will need. One 19 or 28 oz., one can of pork and beans, 1- 28 oz. can of kidney beans, 1-28 oz can or chopped tomatoes, 2 pounds of ground beef, 1 chopped onion and 2 cloves of chopped garlic. And this time of course I added 2 cobs of corn. 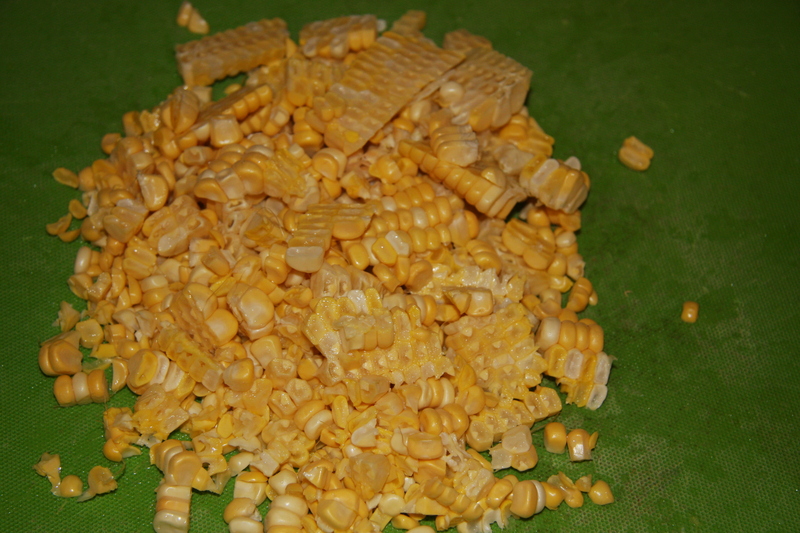 After cutting them of the cob. 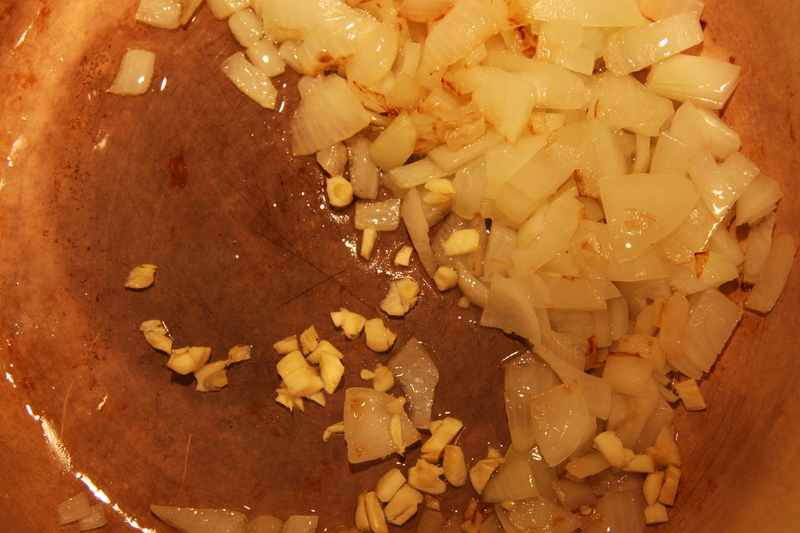 In a stock pot or large frying pan add your onions and garlic and fry until onions are translucent. 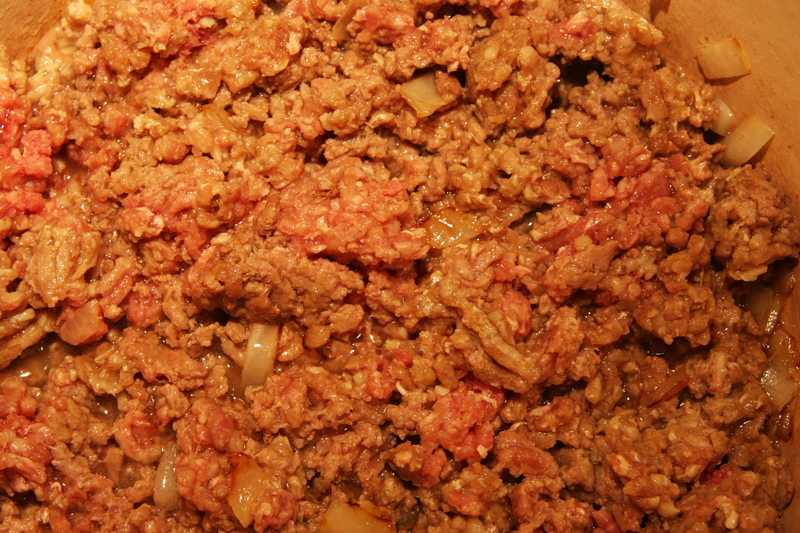 When onions are cooked add your ground beef and stir fry until meat is cooked. Next add all the other ingredients including salt and pepper and give it a good stir. 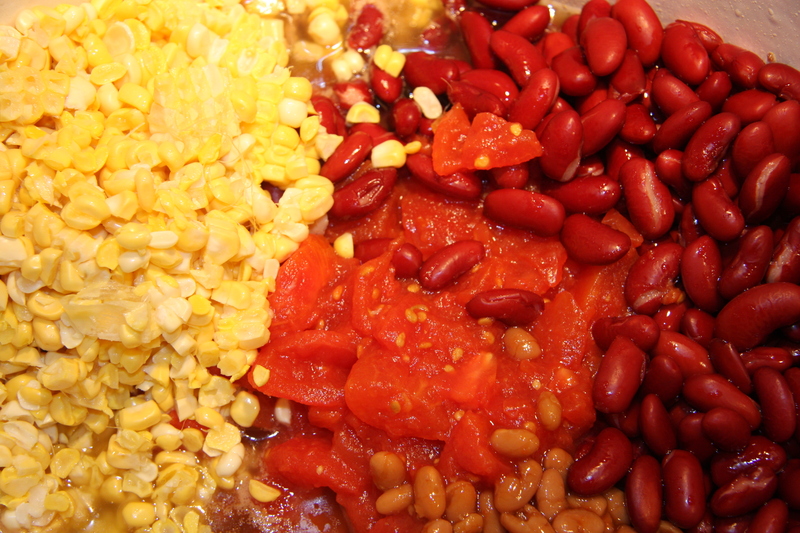 Bring to a boil then reduce heat and simmer for 1 1/2 – 2 hours, partially covered. 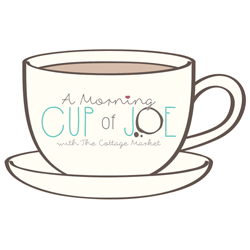 Pour into a serving cup or bowl and enjoy! Heat oil in pan then add your chopped onions and garlic. Fry for a few minutes and add you ground beef. At this point you can add the crushed chilies. Fry the meat until there are no pink or raw bits left. Then add the rest of your ingredients, bring to a boil, reduce the heat and simmer partially covered for 1 1/2 – 2 hours. It will thicken, if it doesn’t then uncover and cook a bit longer. If someone cannot eat things that are hot, then add your crushed chilies or hot sauce when you place the chili into a bowl. 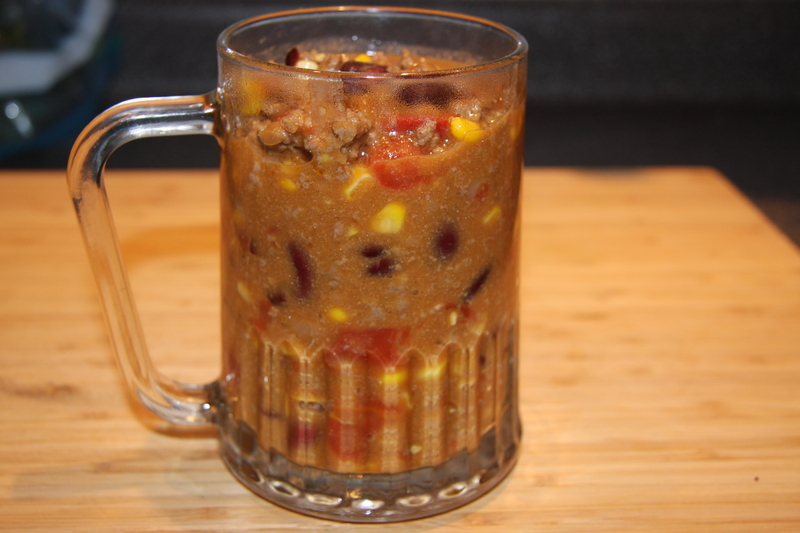 My husband loves this chili and other then hot dogs, he will request that I make this. With or without corn. A perfect meal for cold winter days.